Many people think Annie Oakley came from the wild west, and in a sense, they're correct. The shooting star known as "Little Sure Shot" was born in an area known as "the wilds" of western Ohio, near a little town called North Star, so perhaps it was pre-ordained that she become one of the world’s best-known shooting stars. 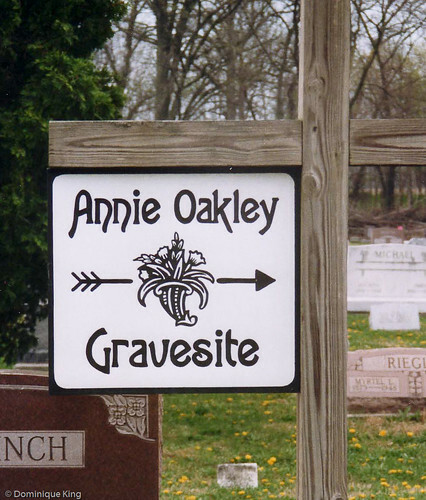 Discovering Annie Oakley's gravesite came as a surprise as we were driving Highway US-127 along Ohio's western border. 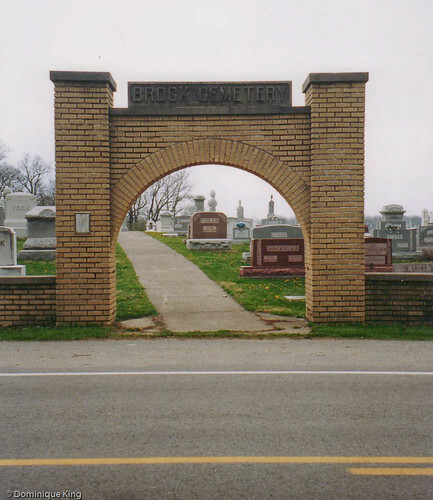 I spotted a small sign along the side of the road pointing to Annie Oakley's grave, and I immediately turned off of the main highway to travel about a mile on a side road to reach the rather unassuming Brock Cemetery. Annie Oakley was born in a log cabin about five miles east of North Star in rural Darke County on August 13, 1860 as Phoebe Ann Mosey. 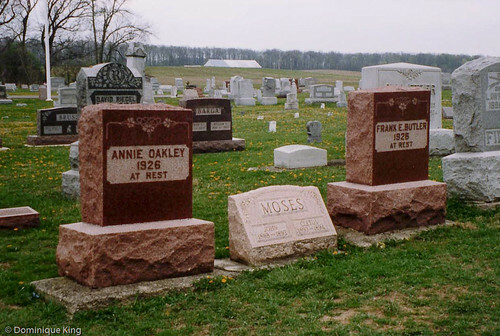 Spellings of her family's surname include "Mozee", "Moses", "Mauzy", and "Mosty" among other variations, but her living relatives at the Annie Oakley Foundation go with "Mosey" because that version appeared on her father's gravestone and military records from the War of 1812. His death plunged the family deeper into poverty. Phoebe lived at the county "poor farm" for a while, and then went out to live with, and work for, an abusive family. The Mosey family reunited around the time Phoebe was 13 or 14. Phoebe Ann began using her father's old rifle to hunt by the age of eight. Her shooting helped feed the family, provided meat they sold, and helped pay off the mortgage on the farm by the time Phoebe was 15. In 1875, she won a contest in Cincinnati, Ohio, against marksman Frank Butler. The two eventually married, and Phoebe took the stage name Annie Oakley from the name of an area near Cincinnati where she and Frank lived as she began touring in circuses with him as his assistant. Frank Butler quickly realized that his wife was more talented and marketable, so he became her assistant and manager. Annie and Frank joined Buffalo Bill's Wild West Show in 1885, where Annie was the star attraction for 17 years. Annie's signature shooting tricks included shooting dimes tossed into mid air from 90 feet away, splitting a playing card in two edgewise with a shot from 30 paces away, and shooting the ashes from a cigarette her husband held in his mouth. Annie Oakley taught many women to use guns. She felt shooting was good physical and mental exercise, and an excellent means of self-defense. She offered to organize regiments of female sharpshooters during the Spanish American War and World War I, even promoting the idea of women serving in combat positions with the armed services. No one took her up on those offers, but Annie did demonstrate gun safety to servicemen during and raise money for the Red Cross during World War I.
Annie died of pernicious anemia on November 3, 1926 in Greenville, Ohio. Frank Butler died 18 days later. 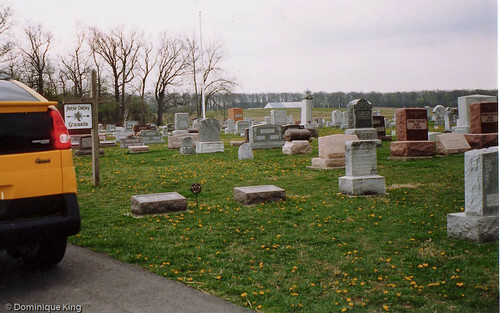 As you can see in the photos here, the couple's gravesite sits among other graves and near the cemetery lane, with another modest sign. A stretch of Ohio's route 127 in Darke County became "Annie Oakley Memorial Pike" in 2000, and it only seems fitting that a sign in the village of North Star identifies it as being near the birthplace of one of the world's best-known shooting stars. Addendum: The State of Ohio erected a historical marker next to Annie's grave shortly after our visit there. You can see a few photos of the marker by the gravesite at the bottom of this page.